It is 8:05 PM in the Kennedy Center Opera House. 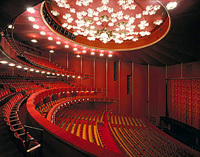 You take your seat for a performance of a world-famous ballet company, opera or the season's hottest musical. As the house lights dim, the unseen oboist in the orchestra pit sounds a single pitch. He is joined by woodwinds, brass, and strings as they tune their instruments. The evening's conductor makes his way through the pit, acknowledges both the orchestra and the audience's applause, and lifts his baton. With a wave of his hand, the performance begins. The music fills the hall, but the musicians are nearly invisible to you. Who are they? Have they traveled with this renowned production from Moscow, London, or Broadway? Actually, they are members of this community, and may live just down the street from you. The Kennedy Center Opera House Orchestra is the resident orchestra of the Kennedy Center, and provides the music for most ballet and musical productions that take place at the Center. Additionally, this orchestra has performed on the Millennium Stage numerous times and performs annually on the Concert Hall stage as part of the Messiah Sing Along. This same body of musicians provides the music for all of The Washington Opera performances under the name The Washington Opera Orchestra. Every year we reach a national audience with the CBS television broadcast of the Emmy® Award-winning Kennedy Center Honors. Spend a few moments and learn a bit more about the history of the Kennedy Center Opera House Orchestra. Music by Claude-Michel Schönberg; Lyrics by Alain Boublil, Richard Maltby, Jr.